Learn how to best use Gatherings, Groups and Sessions to suit your Church's set-up. Multiple Groups or Multiple Gatherings? A Gathering brings together all your separate Children or Youth groups that meet on a specific day, or are of a specific type; Gatherings are the core of organising your groups. However, how you set them up is completely your decision, allowing you to more accurately reflect the ways your Church does things. We suggest that the starting point for mastering Gatherings should be creating a separate Gathering for each separate day that you run your children or youth programmes. For example if you have a Tuesday Gathering of 4 groups then create a 'Tuesday' Gathering and populate it with the 4 relevant groups. Creating a Gathering is easy. Simply go to "Children" > "Groups" > "Add Gathering". In doing this it will also allow you to create the groups within that Gathering; for guidance on this see below. Groups are where the children are actually added. This can be done on an individual basis or en masse; for guidance on how to do this have a look at our support article on "Adding children to groups". A child can only belong to one group within a Gathering, so if a child belongs to multiple different groups (e.g. Tuesday small group, Thursday fun group, Sunday Kids AM, Youth PM) you'll have to ensure that these groups are all contained in different Gatherings. To create a group you'll have to have edit an existing Gathering, or create a new one through "Children" > "Groups" > "Add Gathering". This will allow you add groups within your Gathering. 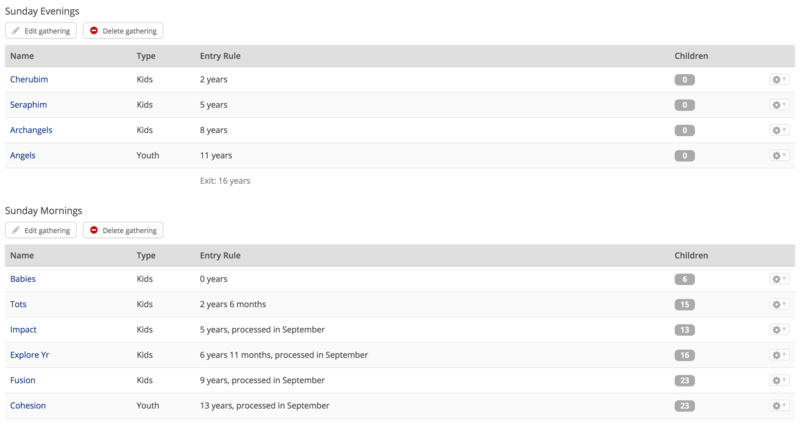 It will also allow you to define the entry criteria of the group. 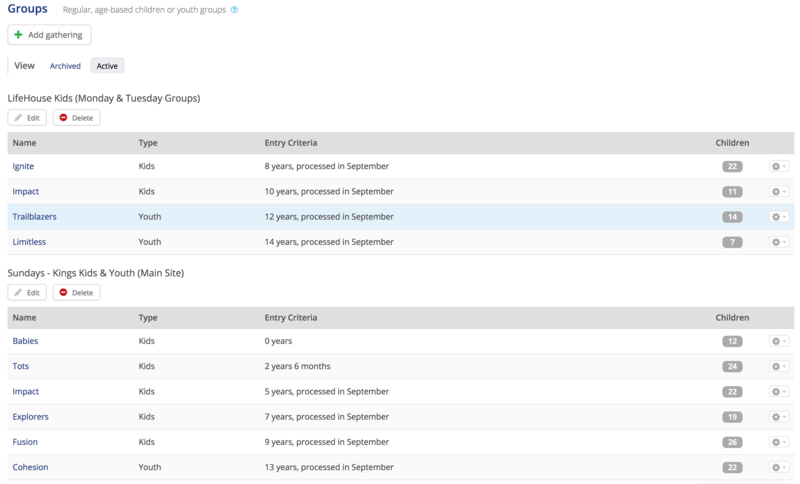 Groups in ChurchSuite are age-based, so you will be able to set entry based either on birthdays (i.e. so that a child moves up on their birthday) or on the age they are on a certain date (i.e. only children who are 5 on, or before, the 1st of September can move up to this group). The latter of these will be particularly useful where your group is based around school years. 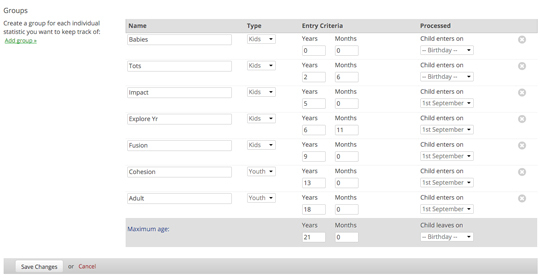 It is worth mentioning that, although you set entry requirements, ChurchSuite will not automatically process children through groups, giving you the power to bend or break these entry requirements in certain situations. There are often times, as a church's children/youth ministry grows and evolves, that the ministry and groups are restructured. Rather than lose all that valuable attendance data, it is possible to archive groups, rather than delete them. If you do archive all the groups in a Gathering, you can then safely delete the Gathering without loss of data; allowing you to create a new Gathering and Groups for your revised ministry structure. 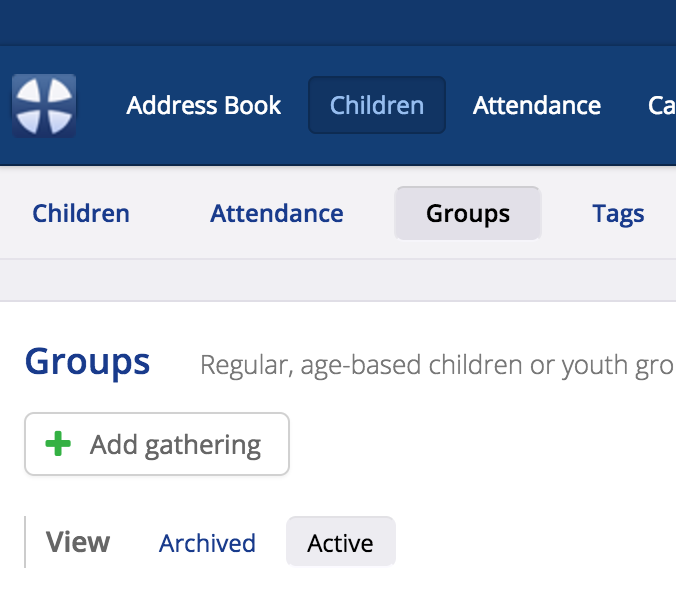 When viewing your active Groups in the Children module, you can archive a group by simply selecting "Archive group" from the Group options cog. Note the on-screen warning! Archiving a group is not reversible. While attendance data is retained, the group will be set as archived and all children assigned to the group will be removed. If you are happy, continue to follow the on screen confirmation prompts. Archived groups can still be viewed in the "Archived" section of the Groups page - just toggle from Active to Archived to view the list and select a group. Opening an archived group will display the historic attendance data for that group. A session allows you to log attendance data from a Gathering but links it to that specific time or event. Utilising sessions correctly should reduce the need to create lots of groups and Gatherings, and enables your data to be more organised in the process. A Gathering can have multiple sessions. For example you could have a Sunday Gathering, and then create a 9.30am session, a 11.30am session, a 4.30pm session and a 7.00pm session. For each session you can log attendance for anyone within any group that is in your Gathering. A child can be logged as attending multiple sessions within a Gathering as well (e.g. if a child attends their group at both the 11:30am and 7pm services then the attendance information will show that, rather than just showing that they were present on that date). The main advantages to creating Gatherings like this, and using sessions to differentiate between them, is that it allows you to track data across sessions and track data across a group as a whole. If I want to see what the attendance was like at the 12:30 Fusion group across a term I can do that by looking at the 12:30 session data for the group; but I can also see what attendance has been like at the Fusion group across all services across the term. Although the general guidance is that you should have a Gathering set-up for each day that your Children or Youth ministries run, there may be circumstances or situations where your arrangements are more complex, requiring additional levels of organisation, or a differing structure altogether. For Sundays, we realise that many of you will have multiple meetings, often with the same groups, but different personnel; maybe you'll have 2 identical morning services or maybe you'll have a morning and evening meeting. Again, how you set this up is up to you, but we would suggest that in most cases a single Sunday Gathering containing all of the groups that meet across all of your services should be sufficient. The way to differentiate between services in these cases is to utilise 'sessions'. Although a session can be used to log attendance data from any group within a Gathering, creating a session will only log data for the groups which you select to record attendance for; it will not affect any others. So if you have a single Sunday Gathering including all your Children's and Youth groups, but your youth only meet in the evening, don't worry, recording the children groups' data in the morning will not affect your youth attendance data at all. Often the make-up of a group that meets mid-week will be very different from the make-up of the same group that meets on a Sunday; however where this isn't the case then creating separate groups in separate Gatherings can be a bit unnecessary. In these situations you could create a Gathering for that group 'e.g. Youth Group' and then distinguish between different meetings by using sessions. You may also want to use sessions here to distinguish between activities that your group gets up to. If you have a mid-week group you may normally record this session as 'microgroups', but if one week you decide to go out for a social, or do something different, you can create a new session title, such as 'microgroups social'. The other exception is where you have a group that runs on the same day as other groups but doesn't have entry criteria consistent with the other groups; e.g. you may have 4 morning groups (for ages 0-5, 5-11, 11-14 and 14-18) however you also have an evening group which is open to 10-16 year olds. A child can only belong to one group within a Gathering, so in instances where they would belong to 2 completely different groups you'll have to create 2 different Gatherings; a Gathering for the 4 morning groups and then a Gathering for the evening group. During child check-in, the session name is recorded against each attendance entry. This can be viewed in "Children" > "Attendance". Each time a new session name is created it is added to the "Suggested names" list. It should not be necessary to create a new session name each time you use the check-in system - you can often use the same one each time. However, you may find that you have unwanted session names on the "Suggested names" list that other users have inadvertently created - how do you remove them so that they are not continually re-used? From the "Sessions" report in the Children module (Children > Reports > Sessions*), you can delete unwanted past Sessions, allowing you to clean up the list of "Suggested names" visible when selecting a new check-in Session. You must delete all instances of a Session name in order for it to be removed from the "Suggested names" list. *Note that there are two "Sessions" reports - one in the Children > Reports > Attendance reports section, and the other in the "Child Check-in" reports section. You'll need the latter. Note: Deleting a Session does not delete the associated child attendance records for that Session - these continue to be recorded in Children > Attendance, and child check-in times continue to be viewable through the "View all attendance" option on the child's contact profile page in the "Recent Attendance" section. As an alternative to deleting historic child check-in sessions, you can also "edit" them. In this way you can "edit" any wrongly-named sessions to make them consistent with your preferred session name(s); and in doing so, eliminate all instances of an unwanted session name from the "Suggested names" list. In the example below, the session was originally named "9:30 Service", but is being re-named "9:30 Morning Service"